5 | 22 students enrolled. 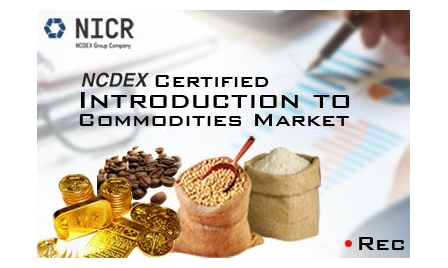 The “NCDEX Certified Introduction to Commodities Market Module” online course will build your understanding of global and Indian commodity market. This course gives you basic understanding of derivatives and teaches you the pricing mechanism of futures. You will be introduced to basic principles of hedging, speculation and arbitrage, which are used by various stake-holders for risk management. This course introduces you with major global and Indian commodity exchanges and emphasizes on their operations and practices, clearing, settlement and delivery procedures, and regulatory and legal framework. Professionals and students after completion of this programme will get a strong head start for moving to more complex aspects of commodity trading. Students enrolling for The NCDEX Certified Introduction to Commodities Market Module will be given a “Certificate of Participation” from NCDEX facilitated by Elearnmarkets, after successful completion of the course. He shall also be given free access to related webinars conducted by Kredent Academy for further knowledge enhancement. Email query support, Question & Answer community platform will also be availed by the student for any kind of doubt clearance related to content while pursuing the course. All the knowledge content is provided by Kredent Academy.